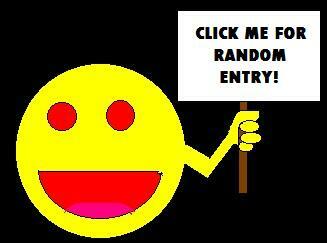 Our 2010 Road Trip, Part 17 of 17: Outtakes for the Drive Home « Midlife Crisis Crossover! 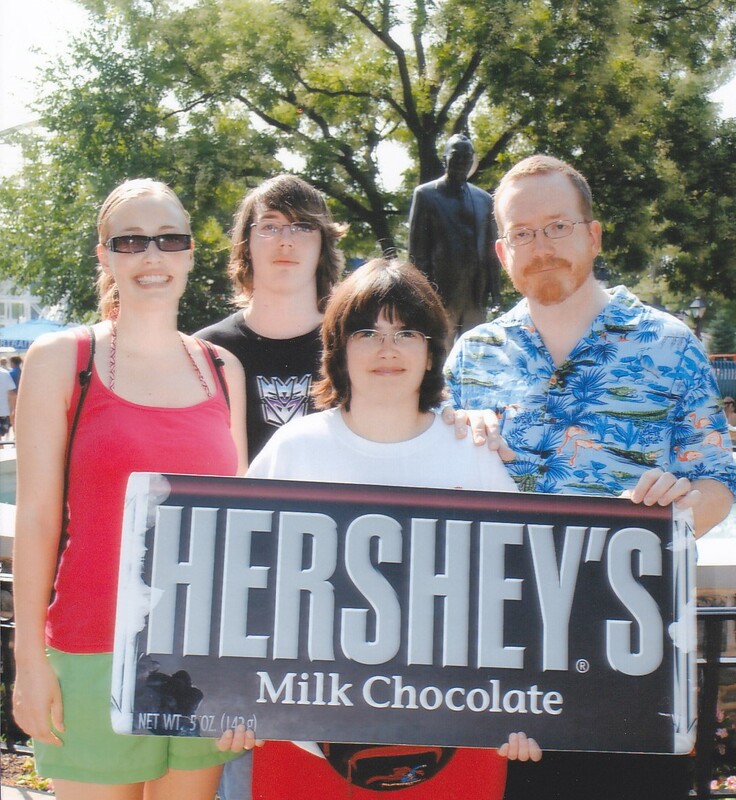 DAY THREE: Our family and our wonderful guide at Hersheypark, ensnared by one of those photogs that lies in wait at amusement park entrances to herd you together for a pricey photo op. …and then we came home. But first: one last round of photos from days past, bonus shots from the previous sixteen chapters’ worth of vacation fun. 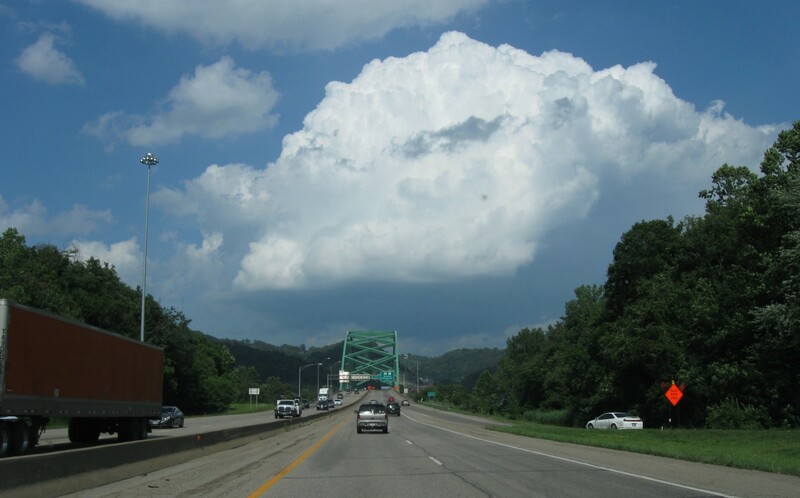 DAY ONE: Puffy clouds greet us upon our return to West Virginia. 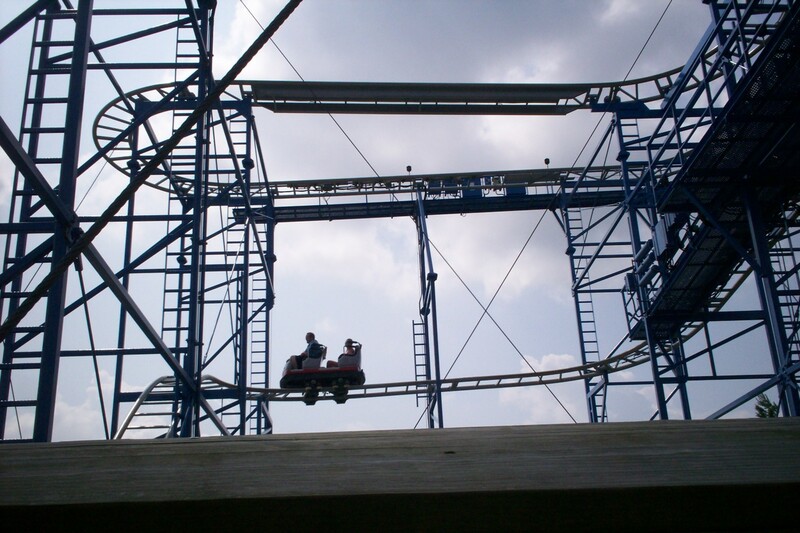 DAY THREE: Three of us on the Wild Mouse coaster at Hersheypark. 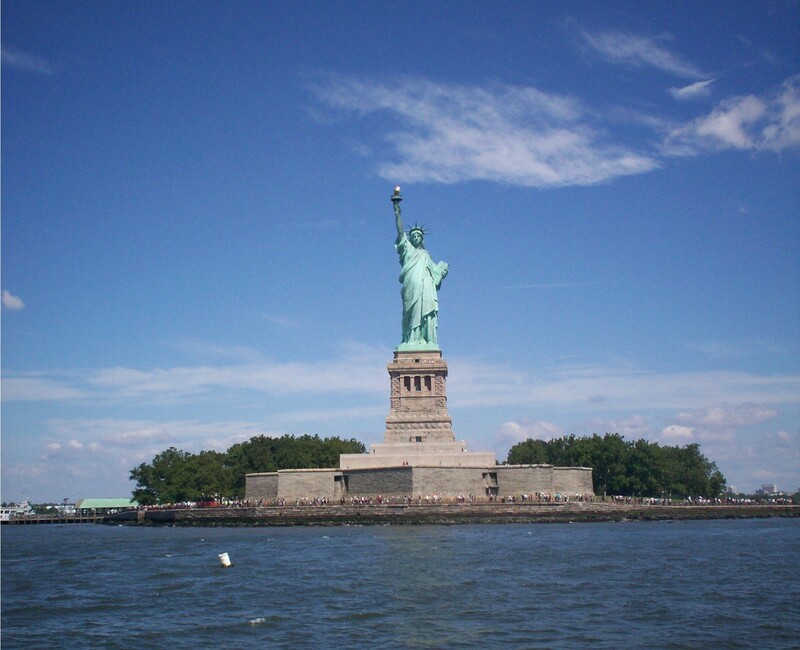 DAY FOUR: the view from our ferry ride to the Statue of Liberty. 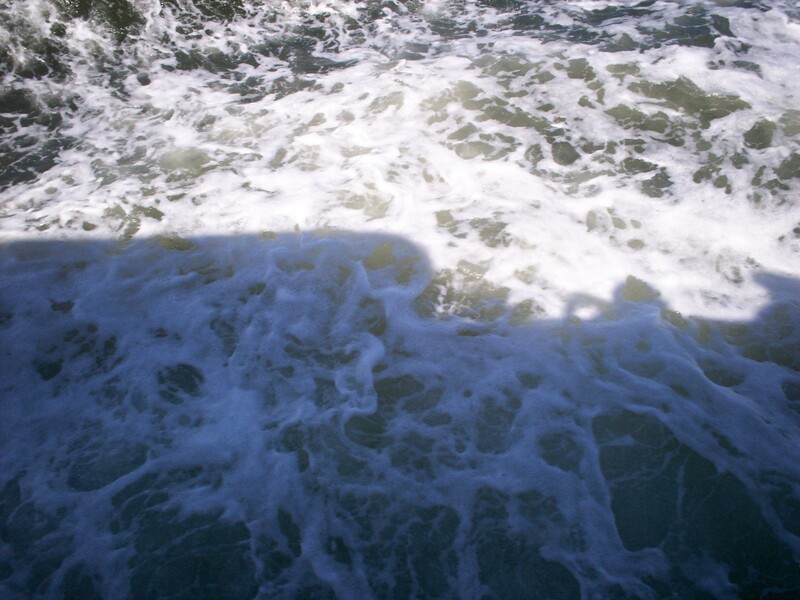 The surface of Upper New York Bay in our ferry’s wake. 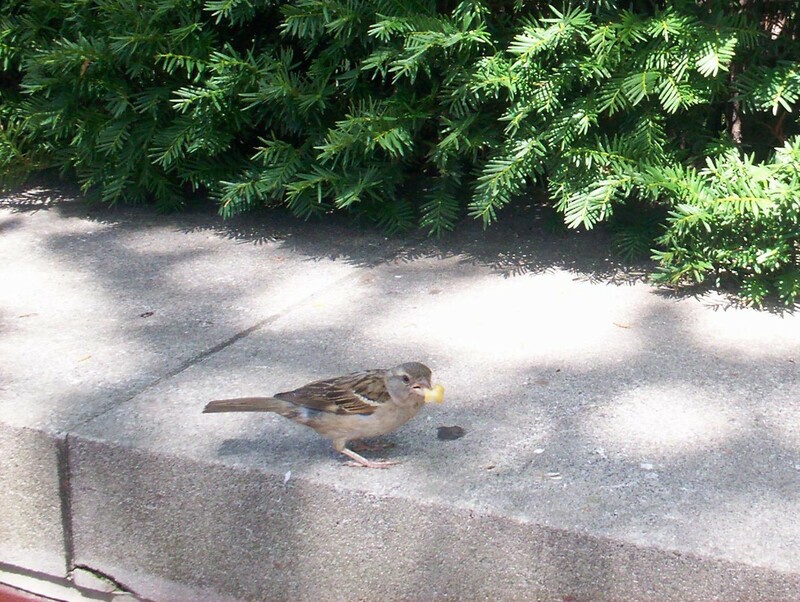 A nosy bird watching us at lunchtime on Liberty Island, wanting to know if we’re gonna finish that. 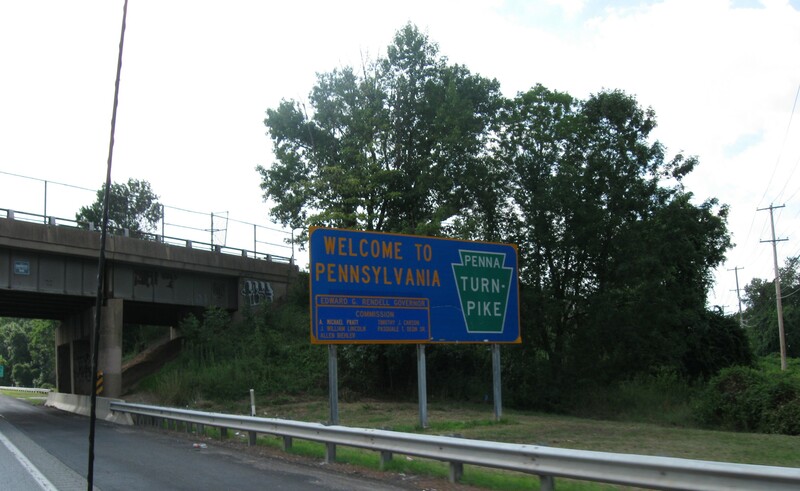 After we visited Lady Liberty from the New Jersey side, Pennsylvania was happy to have us back. 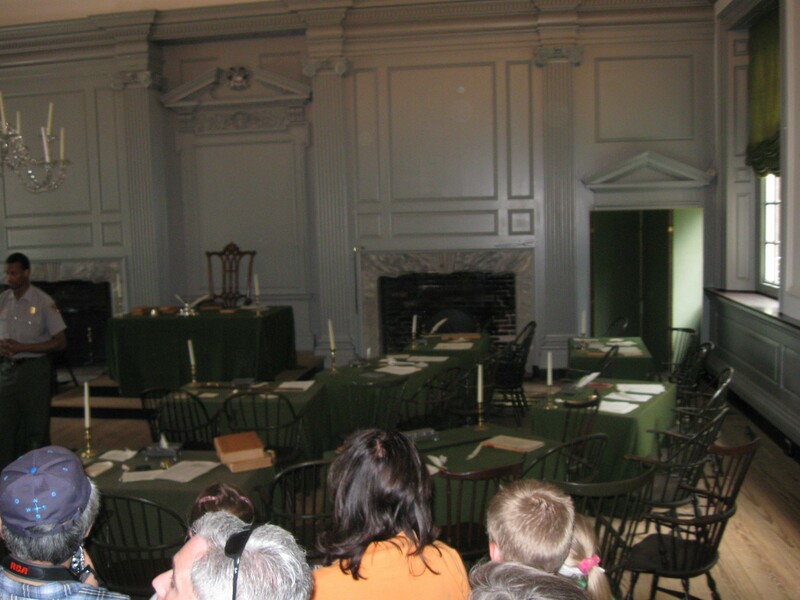 DAY FIVE: Independence Hall featuring our tour guide Eric at far left. 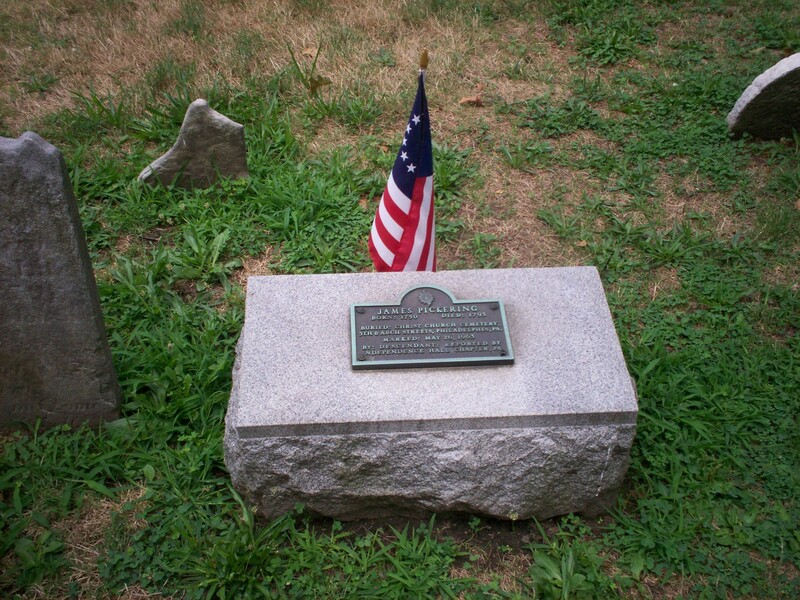 Among the many historic graves in Christ Church Burial Ground is one James Pickering, who, despite this dignified picture, was a relative nobody. 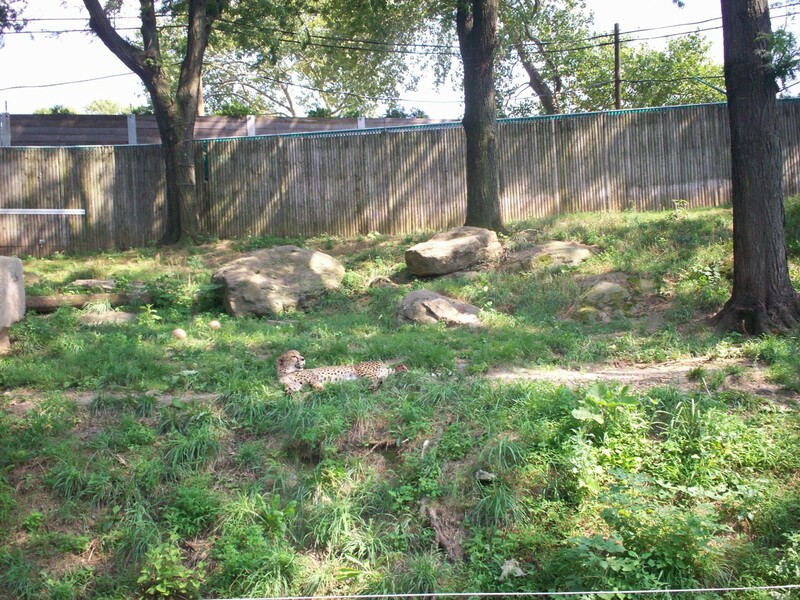 Cheetah in repose at the spacious Philadelphia Zoo. 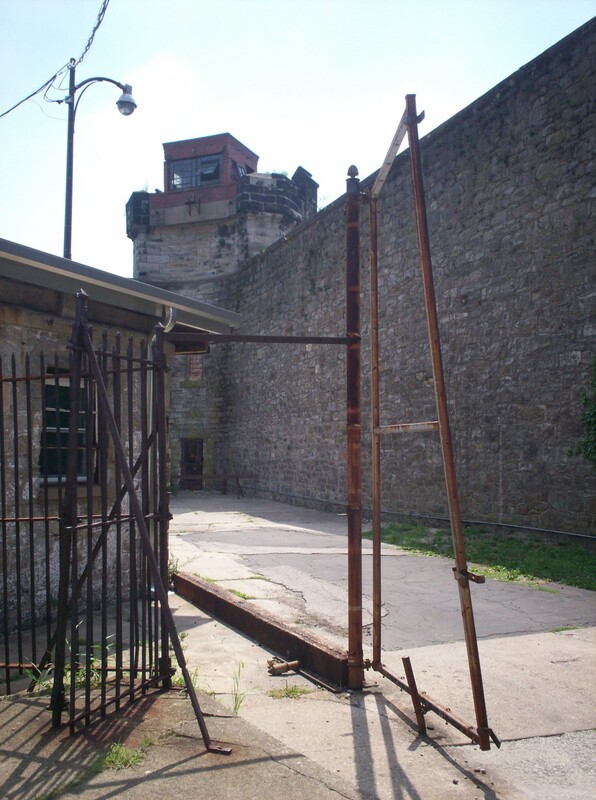 DAY SIX: Guard tower and randomly leaning frames at Eastern State Penitentiary. 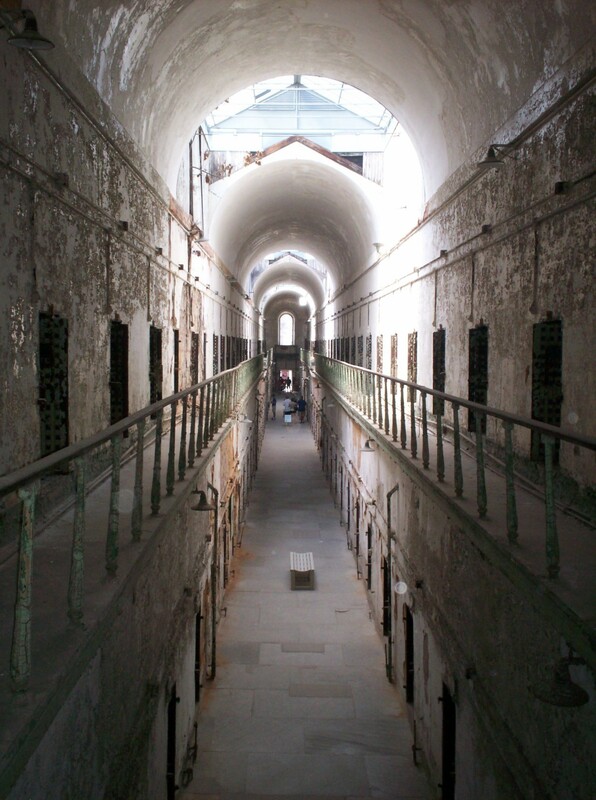 Eastern State alternate shot of another bi-level cell block. 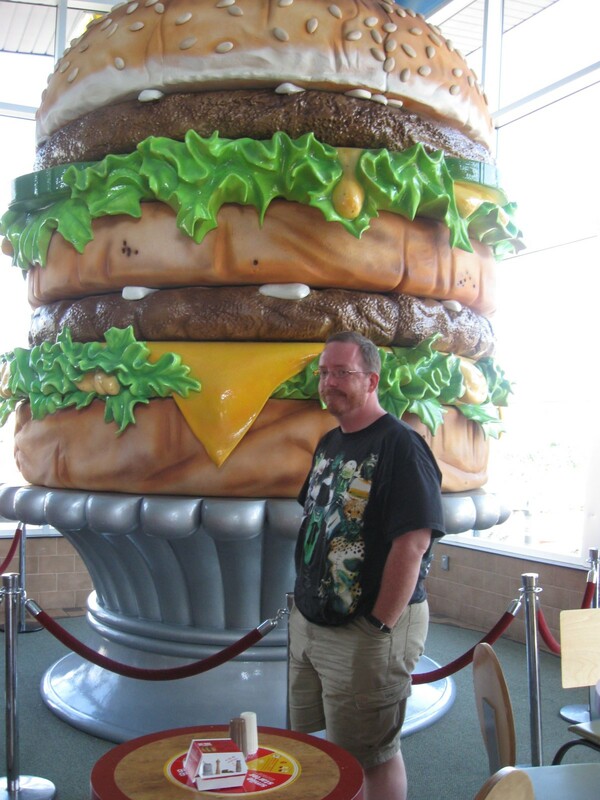 My turn to pose with the amazing colossal Mac at the Big Mac Museum. 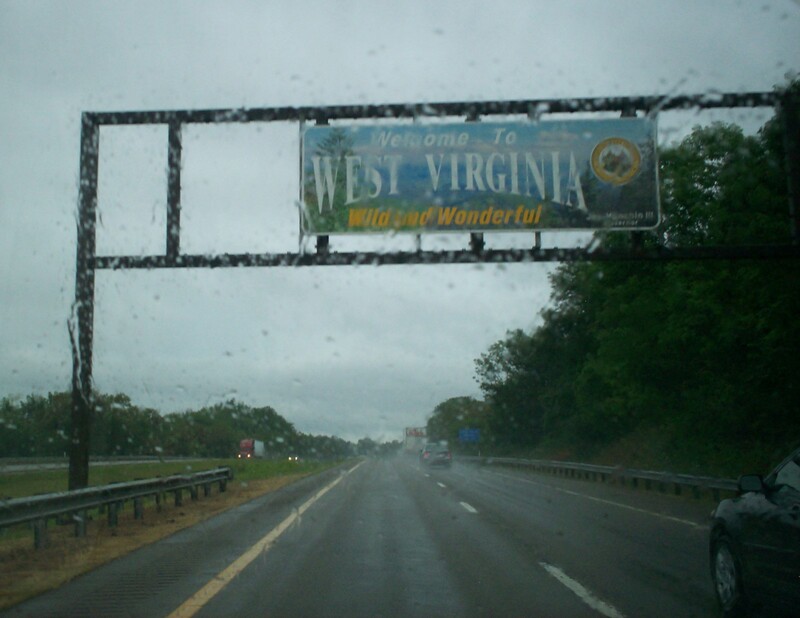 DAY SEVEN: Once more through the upper strip of West Virginia, this time in the opposite direction. 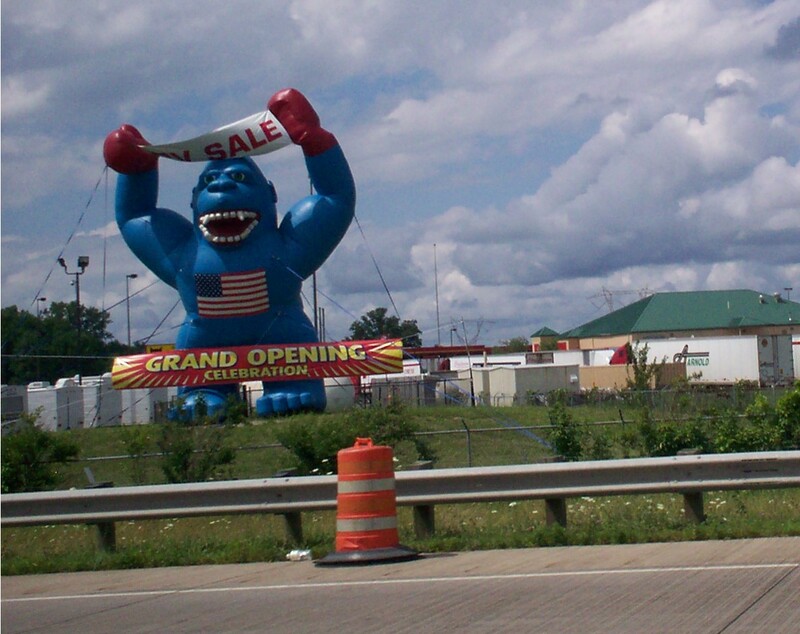 Kudos to this inflatable blue Gorilla, the only new sight that caught our eye in Ohio on the way back. After much dull coasting through the rest of Pennsylvania, part of West Virginia, and all of big fat Ohio, we returned to Indiana in time for dinner. Anne had hoped for some nice place of unusual stature, but this exhausted and slightly homesick driver aimed for a simple populist Applebee’s instead. At least it wasn’t McDonald’s. We reached home at 7 p.m. to find our lawn had gone berserk without my constant glaring, our dog missed us so desperately that his fawning nearly clawed Anne to pieces, and our Internet connection had turned emo and disabled itself in some kind of complicated snit fit. Nevertheless, even if our home wasn’t in one piece, I was glad we were, to say nothing of the rental car, which survived the week’s harrowing drive without a scratch. The same couldn’t be said for one of our beloved restaurants down the street. Once the Internet was alive and cooperating once again, we learned that on the previous Tuesday an elderly woman tried to park in front of our new Five Guys burger joint and instead ramrodded through the front window. That night on TV: a Starz! Kids & Family airing of The Chronicles of Narnia: Prince Caspian, a film about a leader returning home to inventory everything that had gone horribly wrong in his extended absence. Thus our week concluded after 2,080 miles on the rental car and what felt like $2,920 in turnpike fees alone.